I eat this a couple of times a week - this is one of my go to meals as well as an office lunch. Parmesan Cheese - buy a chunk of Parmesan in the imported cheese section and a grater and grate it fresh - try it! Brown meat in a medium sauce pan, mashing with a fork to break up the pieces. Add the pasta sauce. Heat until bubbling. 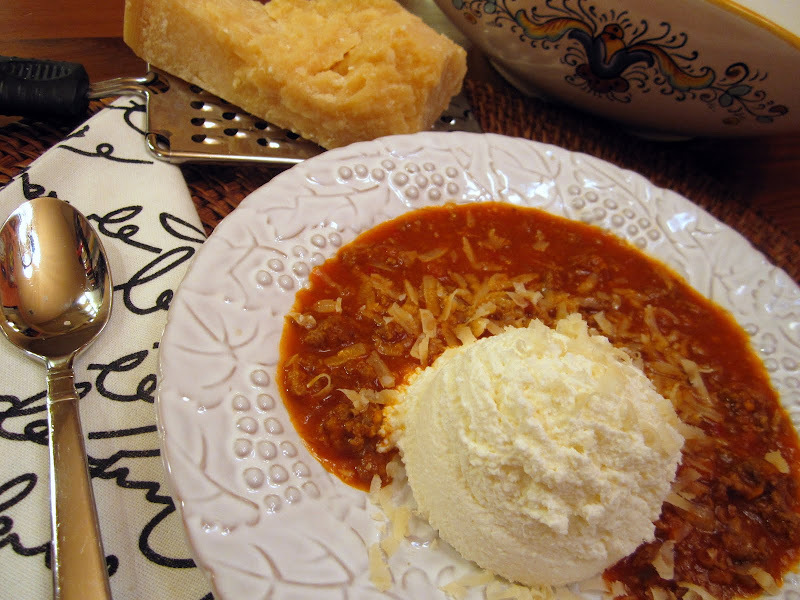 Place a scoop of Polly-O part skim milk ricotta into a deep bowl, and pour a good half cup of meat sauce around it. Serve with lots of freshly grated Parmesan cheese. This entry was posted in Bariatric Recipes, Beef, Lamb & Pork, Main Dishes, Sauces & Salsa and tagged & Lamb, Beef, Dressings, Dressings, Sauces & Salsas, Pork.